SOOC -while driving by a quick shot of this old deserted barn..there is a farmhouse right next to it all boarded up and no visible driveway anymore. the property is totally fenced in. Lovely old structure. Wonder why its been abandoned . . there's a story behind this one, I would think. Nice against the snow! Wonderful capture Bruni, especially since it is a drive by! @karenann the way I look at it Karenann is either the old farmers are in retirment homes and they or their kids are holding on to the property for future real estate value..its situated just a bit our of town but still within the town limit and there are so many subdiviisions going up all around that they might wait for a bite. so let me thank you for your comment and question. I see a lot of these about an hour north of my home. Every spring, my mom and I will go up to the tulip festival there and there's abandoned farm houses and barns all over. I take pictures of as many as I can as we drive by. 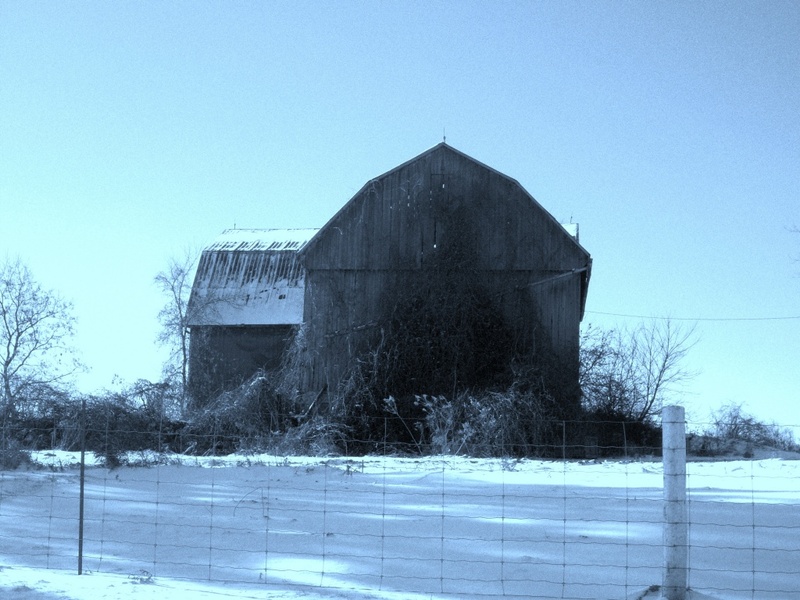 Last year, I realized at least one barn had collapsed and I saw an old farm house, though was unable to get the camera ready for a photo in time, that was in the process of collapsing. They're interesting photos to collect. Sometimes it's sad, sometimes fascinating, and sometimes creepy. Wow, a lot of work to be done there. Wonderful old barn! I just love the tones in this! Great shot on that ( mysterious ) barn . Snow is far from us . 50 degree F.